The 2018 France National Taikai and training camp took place on April 14 and 15 in Paris. 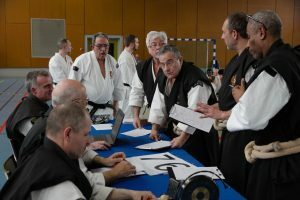 Over 160 kenshi from France, but also from Belgium, Monaco, Holland, Sweden and even the USA gathered to practice and compete during the embukai. The event was supervised by Aosaka Hiroshi Sensei, 9th dan daihanshi. Saturday morning was very sunny in Paris. At 9 a.m., training started with chinkon gyo and taiso. 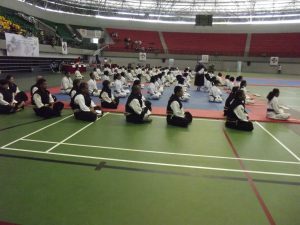 A group of 30 kenshi then separated to take grading examinations, while the remaining kenshi continued practicing techniques with high graded instructors. They studied both goho and juho techniques and had the opportunity to work with kenshi from different branches. The examinees were kenshi from minarai to 2nd dan. 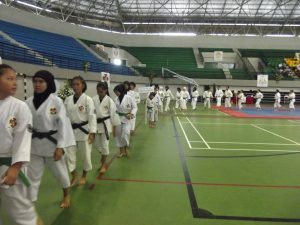 They all gave their best and succeeded in their respective exams, obtaining ranks from 6th kyu to 3rd dan. Congratulations to all of them! The morning session ended with a gakka by Aosaka Sensei. Particular emphasis was placed on the importance of ichi go ichie (to live every day as though it were last) which is the correct way to apprehend our lives. By taking the time every action requires, no more, no less, we can walk on the path of health, strength, security and friendship. The embukai took place in the afternoon. 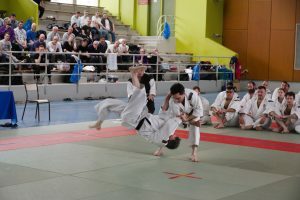 The competition started with a demonstration by Didier Denmat and Frederic Juhel, both 5th dan and received a prize of the best performers in the European Taikai held in Lisboa, Portugal, in october 2015. 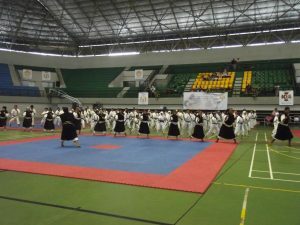 13 kyukenshi and 15 yudansha couples competed. 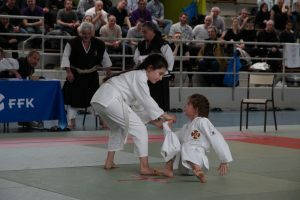 The competition ended with three more demonstrations, one by Yuko Irie Beyer (1st dan) and her husband, Olivier Beyer (5th dan), and two by children, to the audience’s delight. Thank you to all participants ! Best 5th/4th kyu embu : Vanessa Moreau (4th kyu) and Stéphane Fontanet (4th kyu), from Pontchâteau branch. Best women embu: Dominique Pasquier (2nddan) from Vallet Branch and Laurence Joly (4th dan), teacher in Saint-Nicolas-de-Redon branch. At the end of the day, all kenshi were invited by the French federation to have a social gathering and take some time to deepen friendship. 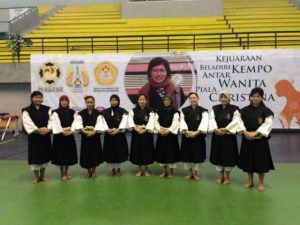 This is also what Shorinji Kempo is for: meeting, getting to know each other, sharing and evolving together. We all had a very pleasant time after this intense first day of the taikai. The training camp continued on Sunday. As on Saturday, it started with chinkon gyo, taiso and kihon followed by pratice in level groups with high graded teachers. 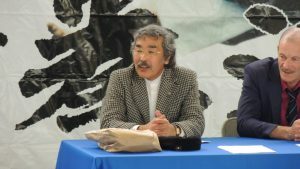 Aosaka Sensei was active within each group, often showing techniques himself, to the delight of the participants. At the end of the training camp, after having changed clothes and said farewell, everyone returned home, looking forward to the next event. This year, the following France national training camp will exceptionally be held in Brussels, Belgium. This will happen on June 16. It was also announced that the next European Taikai will be in Stockholm, Sweden, in July 2019. We deeply appreciate your cooperation and support for the Shorinji Kempo 70th anniversary events. We are happy to announce that the Shorinji Kempo 70th anniversary commemorative booklet “Kakehashi” has been completed. This booklet passes on these commemorative events to the future generations, and we can look back all the history of Shorinji Kempo and its principle, and the present activities through this booklet. I hope you will read it with the kenshi of your branch. We will give “commemorative DVD and pin badge” as special presents to those who reserve this booklet on this occasion. Please use the reservation form for your order.